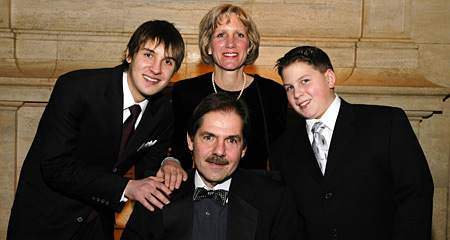 Ralph Russo EMP-17 (center) with his sons David (19) and Nicholas (14) and wife Laurie. The Russo's daughter, Kristin, is not pictured. Marketing guru, educator, spouse, parent, philanthropist, golfer. These words are common descriptors for many Kellogg graduates. But add the word "fighter" to that list, and it begins to describe Ralph Russo EMP-17. The former president and CEO of Sara Lee Coffee & Tea has taken on a new set of challenges in the last few years. Russo was the director of marketing for the 2006 PGA, which was held in Medinah, Ill. His assignment began in 2004, and Russo, a member of Medinah Country Club, says he enjoyed working with fellow club members to create a real "fan experience" during the tournament. Part of his role was to manage all advertising promotion related to ticket sales and hospitality sales. Following his success for the 2006 PGA, Russo was invited to be the director of marketing for the 2012 Ryder Cup, which will also be held in Medinah, Ill. But what makes Russo's story more impressive is he took on this role soon after he began to have the symptoms of amyotrophic lateral sclerosis (ALS), often referred to as "Lou Gehrig's disease," in March 2003. He was officially diagnosed in January 2006, which is when he went on disability leave from Sara Lee. ALS is a progressive and neurodegenerative disease, which means it affects nerve cells in the brain and the spinal cord. Because motor neurons reach from the brain to the spinal cord and from the spinal cord to the body's muscles, their degeneration gradually results in the brain losing its ability to initiate and control movement. The disorder eventually leads to paralysis. "I made it very clear that I was going to live very actively with this illness, and I would make a benefit come from it," Russo says, emphasizing his goal of raising both awareness of the disease and funding for research and those financially unable to afford care. Russo's involvement with the PGA connected him to an opportunity to fundraise for ALS. "As we all got to know each other, the PGA wanted to have a big breakfast in my honor," he says. "They were so appreciative of the work I was doing for them, and they wanted to help the cause." It was so supportive, in fact, that the charity event raised more than $68,000 for the Les Turner ALS Foundation. "I chose the Les Turner Foundation because it has a nice balance between raising awareness and funding," he says. In addition to the event held in Medinah, Russo was the recipient of this year's Hope Through Caring Award at a black-tie gala that raised more than $350,000. This year a new event called ROAR (Reach Out Around Ralph) will be another opportunity to raise funds at a golf outing. Russo also writes articles for the Les Turner Foundation's newsletters and has been very active in raising awareness and funding through local media. One of the reasons he is so passionate is because he calls ALS "an orphaned disease," one that is underfunded but that increases by about 5,600 new cases a year. "Ralph has done a lot and he continues to do so," says Wendy Abrams, the executive director of the Les Turner ALS Foundation. "He is constantly fundraising; he understands it from a business perspective, and now that he is a patient, he is even more adamant about raising awareness and funding for this disease. He's been an amazing partner given his decline in health, and that's rare." Russo, who graduated from the Kellogg School's Executive MBA Program in 1988, credits this education for helping him be able to market and communicate on behalf of those in the fight against the disease. "We all have an opportunity to give back, and this is how I've chosen to do it," he says. "I have learned that there are causes beyond our everyday running of businesses in which we can make a difference with the gifts we have been given."